Now that summer is here, there are lots of activities to do outside! One thing you can do is help toads by building a toad house. Toads, like their cousins the frog, are amphibians. While frogs live near a water source, such as a pond or stream, toads prefer cool gardens where they can catch mosquitoes, slugs, earthworms, and snails. Toads—because they live on dry land—need shelter from the sun and some water nearby. Garden space: Find a shady place in the garden, near a tree or a shrub. Toads are more comfortable when the house is a little hidden. Clay pot: Clay pots work well because they remain cooler inside than the outside air. It’s not clear if the toads appreciate the extra work, but it is a lot of fun to create a special house. 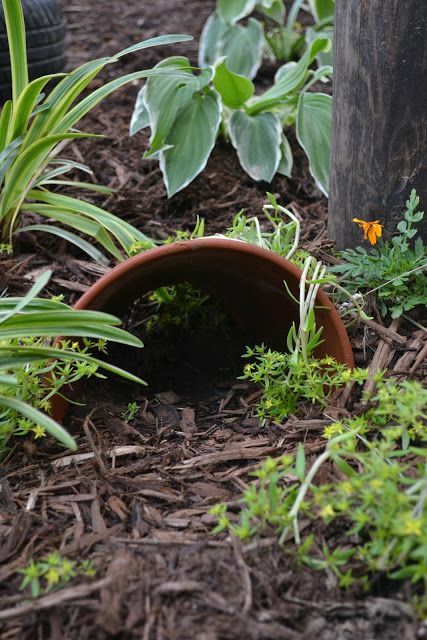 Take your trowel and dig a hole so that when you lay your clay pot on its side, it is about halfway in the dirt. Take the extra dirt and bury the back end of the pot. Make sure there is an entrance for the toad to go in and out. 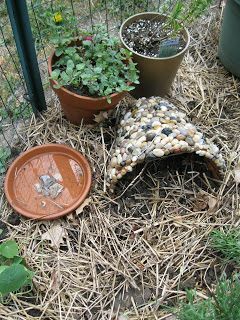 Place the small saucer or lid face up in the dirt and fill it with water. You can make your toad house as plain or fancy as you want with glued-on rocks or shells and paint. Check regularly to see if a toad finds your house. Toads need water, so if you want the toad to stay, check the water often. Adapted from Felder Rushing and Wayne Vincent’s Better Homes and Gardens, New Junior Garden Book: Cool Projects for Kids to Make and Grow, 1999.